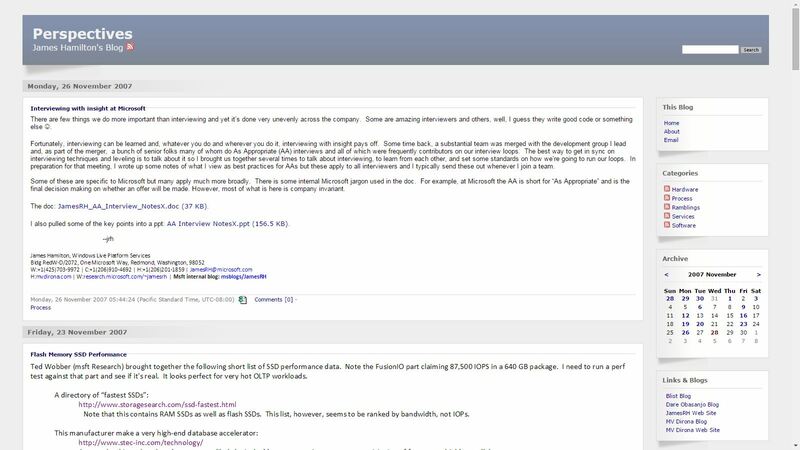 Back in 2005, I maintained a blog accessible only inside of Microsoft where I worked at the time. Having the blog internal to the company allowed confidential topics to be discussed openly, but over time, I found much of what I was writing about might be useful externally. And I knew, if I wanted to have a broader dialog on some topics it would simply have to be external. So, in 2007 I moved the Perspectives blog external. 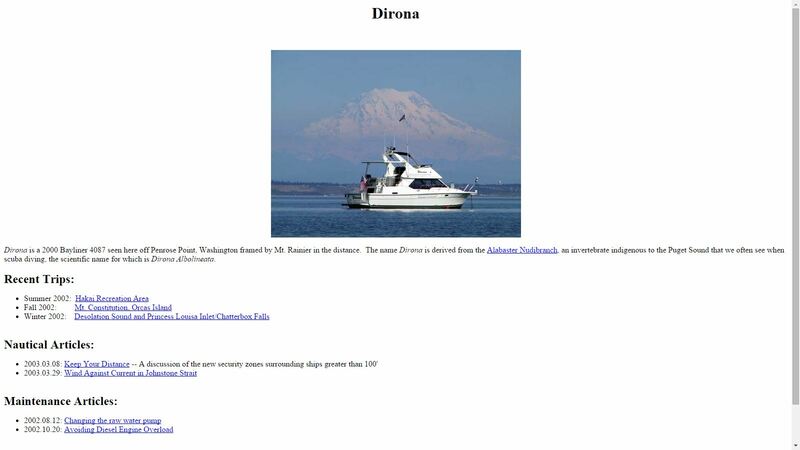 I already had a boating web site at mvdirona.com hosted with GoDaddy since 2002, so I put the perspectives.mvdirona.com blog there. The choice of GoDaddy as a hoster is hard to explain these days but, back in 2002 cloud computing didn’t exist, few options were available, and GoDaddy was a only a five-year old and still somewhat nimble start-up. They may have never been great from a customer service perspective but they did offer good value. And, in the end, as long as the site was up I didn’t really need or even want customer service. That choice worked fine for many years. Looking at the rest of technology stack, I chose Das Blog as the blog software, a common option at that time. I chose to use an all Windows stack since I worked at Microsoft and I really ought to use what our customers were using. 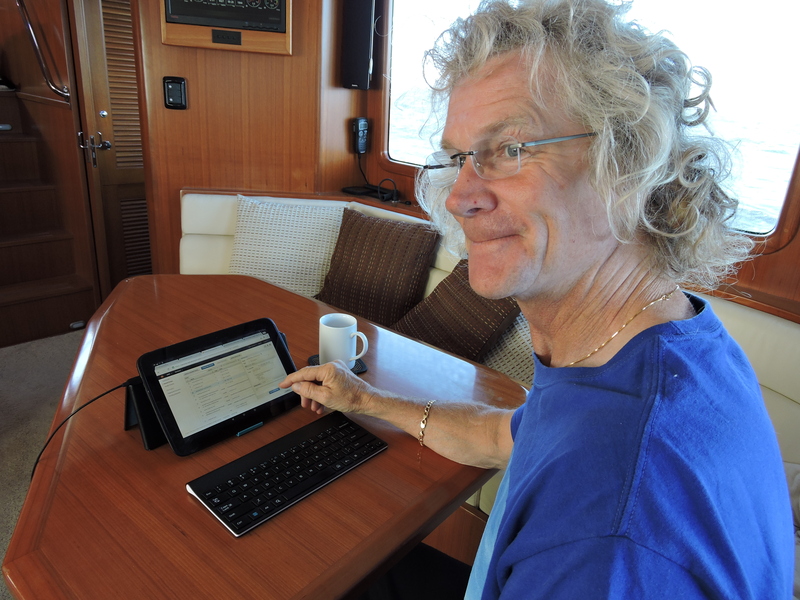 We also started a boat blog at the same time at blog.mvdirona.com. The last 5 years with GoDaddy have been tough. About once a year, some administrative error or unannounced administrative action takes down the web site. I know that 100% uptime is truly difficult to achieve and I don’t expect 5 nines (99.999%) of availability. 3 nines would be fine and, hey I’m not unreasonable, if they could hit 99.5% availability and not make me spend my entire life on the phone with support, I might even have been able to live with it. Sadly, last year was a 1 nine performance. For someone whose entire focus at work is large system scalability, cost, and availability, it’s somewhere between depressing and embarrassing to not be able to get even close to 99% availability. But, in many ways, it was a good experience in trying to find time to move the blog in that it closely parallels the decisions enterprise customers have to make when deciding what to do with older workloads and when they should be moved to a new platform. You might think that whenever there is a better choice available where the service is better or the cost is lower, customers would just jump on it. But the truth is, we are all super busy and unless the pain is catastrophically high or the economic gain material, the app stays where it is and we just have to endure the pain. That’s why it is super important to choose the right technology and the right technology partner when you do make a decision with a new application. No matter what you think going in and even if things go badly almost from the start, invariably the relationship ends up being a long lasting one. Moving costs money and time. Companies have businesses to run and re-platforming applications isn’t the top priority for customers or shareholders. On a much smaller scale, the same is true of me. I’ve got a life to lead and, as much as I would like to be on the latest technology stack, I’ve got a full time job and other commitments that keep me fairly busy. This decision that I knew I had to make just hung around for nearly 5 years. During that period, I knew I absolutely had to migrate the site but more pressing commitments always won. Moving forward to a couple of weeks ago, it’s 2015, and I have a blog still running on Das Blog which is getting to be a pretty tired old choice. I could move to WordPress but I’m running on Windows and I really would prefer to be on Linux for the superior cost structures, higher reliability, and the productivity of the administrative environment. But moving from Windows to Linux is a lot of work in dealing with all the file path separator issues, file system case sensitivity problems, and the large number of differences between IIS and Apache. I could have made all these changes and stayed with GoDaddy. But fresh off another unnecessary and lengthy outage, I was now ready for whatever work is required to migrate the site. Looking past the poor operational record at GoDaddy, the economics aren’t looking as good as they used to either. When an administrative action or inaction takes down the site, there is no way anything will ever happen unless they are called repeatedly and near constantly. At times, I have even resorted to cheating and directly contacting members of the GoDaddy leadership team that I happen to know. It’s tiresome, I hate having the site down, the personal time cost is annoying and, making it worse, the 7 day outage in 2013 happened while we were at sea in a small boat between the Society Islands and Tonga, and all the calls back to GoDaddy were via an expensive satellite phone link. Considering all the costs and poor operational results, it was clearly time for a move. The transition is now done, I hope you like it, and wow, what a relief. I know there will be downtime again in the future but I’m almost looking forward to it at this point. Just being able to log in and make whatever change is needed rather than calling support and trying to convince someone that it really isn’t working, no I didn’t change anything, no I don’t want to upgrade to the new premium service, yes I’ll hold on the line, thanks I do know my call is important, no I really haven’t changed anything, no it’s not the case that it’s coding error on the site, …. There is quite possibly nothing worse that talking to someone who will talk to someone else for you who will eventually open a trouble ticket that will only be looked at a couple of days from now by an over-worked system administrator. I’m sure the administrator that eventually reads the trouble ticket will do their level best but for lack of context, insufficient detail in the ticket, and possibly lack of time, they probably will miss the mark on the first interaction. When 72 hour turnaround on site outage events is policy, the process is slow and very frustrating. Ironically each failed interaction with the site still down yields a fresh request for a customer service survey response. It was a ton of work to move from Das Blog to WordPress, from ASP to PHP, from Windows to Linux, from Goddady DNS to Route53, and from GoDaddy hosting to Amazon Web Services but it is wonderful to have it done. I just love that it’s all open source and that it all can be changed, reconfigured, and there are thousands of experts running the same software all around the world and many are happy to help. It’s great to finally step into this century and, for all those out there trying to figure out when it is the right time to move to cloud computing, get going! It’s so nice not to be “owned” by your provider and to have control back in your hands. It’s wonderful to be on new technology where new features are coming out every week, where there is a healthy ecosystem of companies adding services on top, and where there are experts all over the world. What a relief to be in control and be able to make changes or get issues corrected quickly. Here’s to at least 2 1/2 nines! A year later, with ASP.NET now running on Linux, you could have skipped the move to PHP – and continued to run the entire site in a container! WordPress is SOOOOOOOOO much better than Das Blog that the move was worth it if there were no other factors in play. Other factors that make the move feel like a good one is it takes us off the proprietary Microsoft software stack. It’s really nice to be running on Linux and leveraging the open source community. I hope you are doing well James. It’s been a long time since last time we synced… I am in the bay area now, hacking at Facebook. Hey Savas, it’s a been a while. Good to hear from you. You are rigth there are advantages to distributing services but there are also advantages to having them all in one place. On this project I did a bit of both and, even thought there are lots of componnents with a single provider, they are seperate components and can move indepenently. My natural tendancy is more to less providers rather than more but, even with that bias, there are a few players involved. This project has Route53 DNS registration, Route53 DNS serviing, Amazon EC2 hosting, Amazon EBS General Purpose SSD storage, backup to Amazon S3, Cloudfront Monitoring, Pobox email redirection, and for actual email accounts, Jennifer’s primary is on Outlook.com, I have three: Amazon Corporate for work, gmail, and Amazon Workmail. All parts are independent and all can be changed individually. Good to hear you are at Facebook and having fun. With that set of policies GoDaddy is bound to bleed out over time. Customers move off and never return. Can they sustain this? Is this the most profitable behavior? Hard to believe. To be clear about one important point: The terrible experience you had is a direct consequence of their set of policies. Just like Amazons great customer experience is a consequence of their policies. It’s true that poor service will eventually be rewarded with fewer customers. No company sets out with that goal but, as they get bigger, it gets surprisingly difficult to stay customer focused and stay both efficient and hungry. The good news is that all companies that slip into this “big company” trap have time to respond. Customer leave slowly for the reasons I mentioned in the post: it’s a hassle to leave and they have more important things to do. But, if no action is taken, you are right, the customers slowly migrate away and once that process starts picking up momentum, it’s really hard to reverse the trend. Blake Irving, the current leader of GoDaddy is excellent but he’s only been there 2 years and it’s a big company to turn around so it will likely take time.